If you’re looking for an interesting winter project, you could do worse than taking inspiration from this excellent DIY solar shower video. The shower is designed to fit on a roof rack, be heated by the sun, and provide a 30 psi stream of water with pressure generated by an air compressor. It’s reported to get to about 95˚F after a day of driving around in mixed sun and clouds. Not bad. I don’t think I’ve seen a more well thought out project. And the project’s creator calls it H2OT. Watch him explain and demonstrate the whole thing in a sub-six-minute video. Excellent! Last Sunday I took Illabot Creek Rd., in Washington’s Mt. 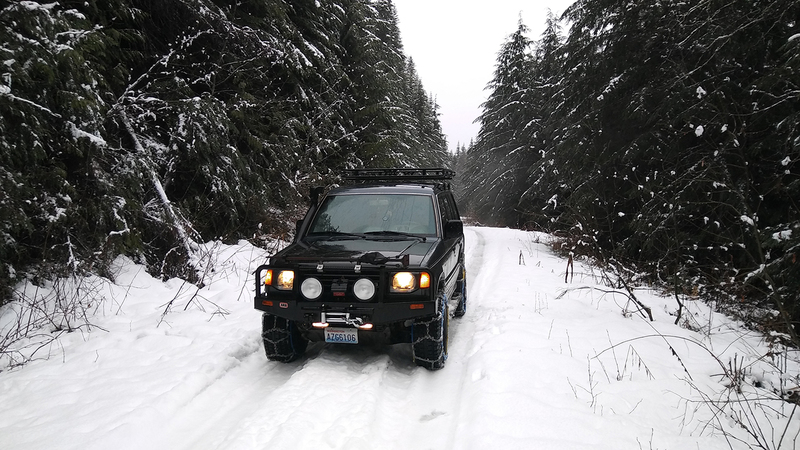 Baker-Snoqualmie National Forest, up to the Slide Lake trailhead for some winter fun and snow driving. Here are some photos and some trip notes at the end in case you go. Chained up and ready to go. This couple has a really nice overland camp trailer set-up that designed themselves on used, military HumVee trailer. It’s so organized and has neat features like solar power, skylights, and rainwater catchment. Thanks to my friend Greg for the tip on this video!